Over the years, there have been occasional releases of Snow White and The Seven Dwarfs to appeal to the next generation of animated movie watchers, and now, seven years after the Diamond edition Blu-ray release, Disney is offering the Signature Edition. While the beloved story hasn’t changed, some of the special features are different on this release. Dubbed "Disney's Folly", Snow White and The Seven Dwarfs was predicted to be a major flop before its release on December 21, 1937. Skeptics argued that nobody wanted to sit through a feature length animated movie but Walt Disney spent two years making the film and betting the naysayers were wrong. As it turns out, you should never doubt Disney, as he was right and audiences loved the film, making it an instant classic. 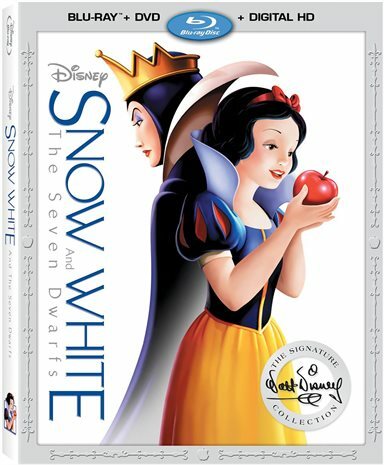 Over the years, there have been occasional releases of Snow White and The Seven Dwarfs to appeal to the next generation of animated movie watchers, and now, seven years after the Diamond edition Blu-ray release, Disney is offering the Signature Edition. While the beloved story hasn't changed, some of the special features are different on this release. Of course, we all know the tale of the "fairest one of them all" and the evil queen who is out to destroy her. When she flees the castle and wonders in to the woods, she comes across the cutest band of Dwarfs who learn to love her as she cooks and cleans for them. When she falls prey to the Queen, and dies while eating a poisoned apple, they mourn her until the handsome prince saves her with love's true kiss. There are several new features on this release, as opposed to the Diamond Edition, including "Disney View" which allows the viewer to watch the film without the black bars on either side, essentially making the black spaces less distracting. This version also offers the Digital copy, which was not a part of the package 7 years ago. There is also over two hours of features on this Blu-ray, some rereleased and a number of new additions. Of the hour of new features, Disney's First Feature: The Making of Snow White and the Seven Dwarfs is actually a lengthier version of The One that Started It All feature from the Diamond edition. The other new segments include In Walt's Words, Iconography, Designing the First Princess, Facts you may not know about Snow White and the Seven Dwarfs, an alternate scene, and Seventy Seconds (a rap retelling of the story mainly geared towards kids). Even though the original movie was hand drawn and colored in the 1930's, the remastering makes the 1080p high definition video fairly sharp with vibrant colors. Likewise, the DTS-HD master 7.1 audio is very good for such old recordings. My only complaint about the audio came when watching the special features. I kept adjusting the volume so I could hear the old footage . If you didn't buy the Diamond Edition and you are a Disney fan, you need to grab this version while you can. There is some great old footage in the special features and owning a piece of Disney history never gets old. Or if you are the parent or grandparent of a future Disney princess, this is a must have for your collection. Get a copy of the movie that started it all and remember why you enjoyed it when you were young. Download Snow White and The Seven Dwarfs Signature Edition from the iTunes Store in Digial HD. For more information about Snow White and the Seven Dwarfs visit the FlickDirect Movie Database.